A group promoting short-term rentals in New Orleans wants to double the number of days that tourists can rent homes in residential neighborhoods and expand Airbnbs to the French Quarter, where they’re mostly banned now. The proposal would cap the number of whole-home rentals in residential neighborhoods, but it would allow currently licensed rentals to remain. However, even the head of the group behind the proposal, the Alliance for Neighborhood Prosperity, doesn’t expect it to gain traction before May. That’s when five of the seven council members will be replaced with newcomers and when District B Councilwoman LaToya Cantrell will be inaugurated as mayor. A memo describing the proposed revisions calls for limiting new, whole-home Airbnbs in residential districts — regulated through “temporary licenses”— to two per block face. Eric Bay, president of the Alliance for Neighborhood Prosperity, said that’s key to “mitigating the threat of any further expansion” into residential areas. However, that limit would apply to only new licenses, not renewals of licensed properties. “The idea that they’re going to propose block limitations after grandfathering in every single one with a permit doesn’t actually address the problem of entire blocks being taken over by ghost hotels,” said Breonne DeDecker of Jane Place Neighborhood Sustainability Initiative, an affordable housing advocacy group. Bay’s group also proposes a citywide limit of 5,000 such licenses — more than double the 2,100 temporary licenses issued as of this week, according to city records. Overall, there are about 4,000 permits for short-term rentals throughout New Orleans, concentrated in the historic neighborhoods along the Mississippi River. Those neighborhoods have typically grown whiter and richer since Hurricane Katrina. Opponents to short-term rentals say in popular neighborhoods, Airbnbs have taken over, displacing some residents and pushing up others’ rents. 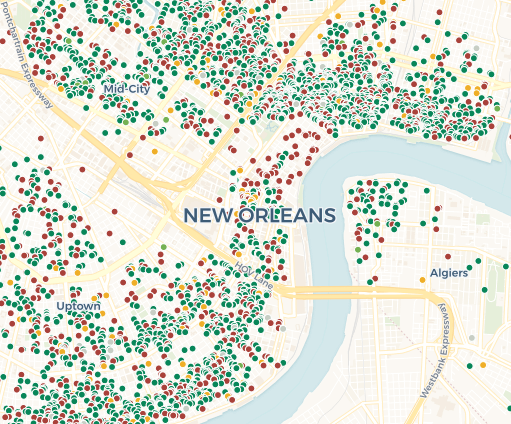 In an October report, The Lens and HuffPost found one block in Treme where 10 of 16 residential addresses were short-term rentals. In Faubourg Marigny, 10 percent of residences were registered short-term rentals. Proponents counter that short-term rentals help locals, who’ve been hit by rising home values and property taxes, make money on the side to pay their bills. His group proposes doubling a nightly tax collected by the city from $1 to $2, which is used for affordable housing and blight remediation. It also calls for significantly increasing permit fees for all three types of short-term rental licenses. While it’s not clear that the Alliance’s proposal will gain support from current or incoming council members, it’s a sign that the debate over short-term rentals is not settled. When council members voted for the law in December 2016, several pledged to revisit the issue after seeing its effects. Groups on both sides have lobbied for revisions, and incoming council members have signaled they want to see changes, too. In general, the proposals would open up more types of properties to Airbnb and it would allow many of them to be rented more often during the year. The group wants to double the number of days that temporary license holders can rent their properties — from 90 to 180. Before the city passed an ordinance legalizing short-term rentals in 2016, the average number of nights that entire homes were being rented to tourists was 147, Bay said. The 90-day limit was a concession to the hotel lobby, he said. Temporary whole-home rentals were pitched as a way to accommodate residents who wanted to rent their homes while they were out of town. Airbnb proponents and Mayor Mitch Landrieu’s administration downplayed concerns that such properties would be vacation rentals exclusively. But Bay conceded that’s how most of those licenses are used. Raising the annual limit wouldn’t have much impact, he said, because those homes don’t have long-term occupants anyway. “It is what it is, a short-term rental,” he said. Commercial licenses, which allow property owners and managers to rent to tourists year-round, would be expanded to condominium buildings in residentially zoned areas, subject to the buildings’ bylaws. Now, those licenses are available only in commercial and mixed-use zoning districts. Such districts are scattered through some largely residential neighborhoods such as Central City and Mid-City. Bay said his group spoke to about 50 condo associations and reviewed their bylaws prior to the adoption of the law. The overwhelming majority, he said, restricted short-term rentals in some way. Accessory licenses, which allow homeowners to rent rooms or half-doubles year-round, would be expanded to apartment buildings with three or four units. How many Airbnbs are in your neighborhood? Half-doubles are among the most common types of long-term rental units in the city, and some have criticized this part of the law as a loophole because it allows long-term housing to be converted to tourist lodging. DeDecker said expanding this type of license to other rental units in three- and four-unit buildings will only exacerbate the problem. The proposal to expand short-term rentals to the Quarter would be a major shift. The 2016 law allows them only on a portion of Bourbon Street near Canal Street. The group calls for allowing short-term rentals in residentially zoned houses in the Quarter, which would open up most of the Lower Quarter that has more of a neighborhood feel. Bay said he hoped that would alleviate demand in neighborhoods adjacent to the French Quarter, like Faubourg Marigny, which has the highest concentration of short-term rental licenses in the city. “The areas outside of the French Quarter, they got bombarded,” Bay said. “When you spray for roaches for your kitchen, and only your kitchen, where do they go? He said his group met with council members or their staff last month to discuss the changes. But council members were worried they would be seen as pushing through an expansion of short-term rentals during a lame-duck period. Cantrell spokesman David Winkler-Schmit confirmed that she met with Bay last month. Winkler-Schmit said it would be tough to get the proposal before the council by May. Land-use matters must be vetted by City Planning Commission staff, then go to a vote before the commission, before the city council can vote on them. Winkler-Schmit said Cantrell declined to comment on the merits of the proposal and whether she would consider it after her inauguration as mayor. “Any conversations about any changes to an ordinance require further conversations and public input,” he said. Friday afternoon, the Short-Term Rental Committee, a group pushing to limit the practice, announced it had heard that Airbnb proponents would “push legislation” at next week’s city council meeting. It called for the council to delay it until after Mardi Gras. But Councilwoman Stacy Head said she doesn’t see the proposal going anywhere with the sitting council. Head said she became aware of the proposal to change the law Thursday night and did not meet with Bay or other Alliance for Neighborhood Prosperity representatives last month. “I firmly believe the majority of the current council has no interest in expanding short-term rentals,” she said. Jeff Adelson of The New Orleans Advocate contributed to this story.